Exact PipeCut attaches to a pipe firmly. After attachment, the blade is always in the correct position automatically and does not need to be guided. The blade chips through the pipe rather than grinding it. This creates burr-free cut surfaces that are ready for jointing. Also, PipeCut does not generate dust or dangerous sparking. The entire weight of Exact PipeCut rests on the pipe being cut, so using it is easy and safe, even in tight spaces. Only about a meter of working room is required. Heavy pipes need not be lifted onto a work table, but can be cut at floor level. During operation, the saw if firmly attached to the pipe and cannot work itself loose from the operator's grasp. Nor does it need to be supported or guided. Cutting small-diameter pipes to size is effortless and quick on a work table too. Exact PipeCut pipe saws can cut a very wide range of sizes. Model 170 can be used to cut pipes with an outside diameter of 15 - 170mm. Model 170E has the same cutting range, but is more powerful, and the rotational speed of the blade can be adjusted according to the material being sawed. Model 200 can be used for all pipes with an outside diameter of 15 - 200mm, and model 360 for all pipes with an outside diameter of 75 - 360mm. 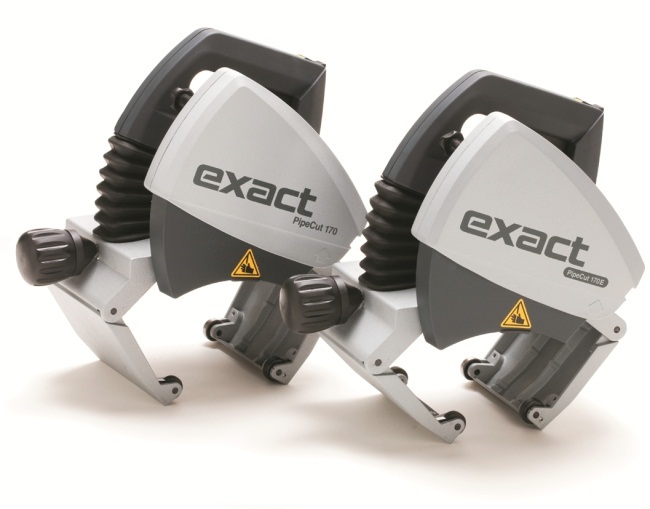 Exact PipeCut saws are suitable for cutting all types of pipe materials. The Exact Pipecutting System is the fastest system on the market; for example, it takes about 35 seconds to cut a DN 100 cast iron pipe with a PipeCut 170 using the Diamond blade. Switching blades on Exact PipeCut saws is simple and quick.